Ok, first off, Mexican food is my absolute favorite. Not only because of the chips and salsa, or the general spiciness, but I grew up with a lot of Hispanic people, so its literally in my blood. Just something about the food itself, its like a comfort food for me (not your average comfort food I know). So me and some friends were trying throwing around some places to eat and I popped up and said “as long as they have chips and salsa I’m in” they narrows down the places real quick, seeing as only two restaurants in town serve them. Escobar’s was the final choice, so off we drove. This restaurant is right on the main drag while your coming into town,or exiting town from Page,AZ. Has a great big yellow sign and is normally always packed, so its fairly easy to spot. As soon as you walk in you are hit with a delicious smell of food. Spices, herbs, meat being cooked, everything! Its hard to put into words how your nostrils will be invaded with mouth watering aromas of Hispanic home cooking. We were promptly greeted and asked how many in our party and asked where we would have liked to be seated. They have an outdoor dining area that we chose to sit in because the weather outside was nice and cool.They had some outdoor remodeling going on, looked like they were enclosing the outdoor area with some walls, other than that it was nice. I was looking for something on the lunch menu, I didn’t want a big meal that would hit me later, and I didn’t want a light enough meal that I would be hungry again within the next hour or two. I ordered the chicken chimichanga (enchilada sauce on the side) which also came with beans and rice on the side. After our orders were taken we were brought our chips and salsa ( omg yum!) For our drinks we all ordered water, so we were brought a picher of water and enough empty cups for all of us. Which made it easy and resourceful since we didn’t have to rely on our waitress every time our glasses were empty. It may have been a total of 10 minutes from when she walked back to turn in our orders that our food was ready. Im stickler for hot food. I absolutely hate when I am served and my food isn’t remotely hot, or when the food isn’t hot enough to melt any cheese on my plate, but not this time. My food was still steaming when it got to my table, which I really appreciated. Of course being the picture person that I am I had to get a good one of my food before I dug in, which wasn’t hard especially because it looked so good already! The beans and rice were very tasted, those are usually the first things to disappear on my plate because they get cold the fastest, but the cheese in my beans did that really cool cheesy thing where it stretches, kind of like pizza in commercials. The burrito was still crispy so it has this really nice crunch sound when you cut or bit into it. The chimichanga had beans, lettuce, and meat inside of it, and guacamole, and sour cream on top. The chicken was shredded and tasted like it had been slow cooked in a pot of awesome sauce! Each bite took was like an explosion of flavor. Sweet, salt, spice, tang, crunch, cream, all of it tied together was amazing! The whole meal put together was a perfect portion, not too heavy, but not too light. I didnt have to un button my pants, but i wasn’t hungry a couple of hours later either. Needless to say i will absolutely be going back sometime when I am in a conundrum about what to have for lunch! Great job Escobar’s! 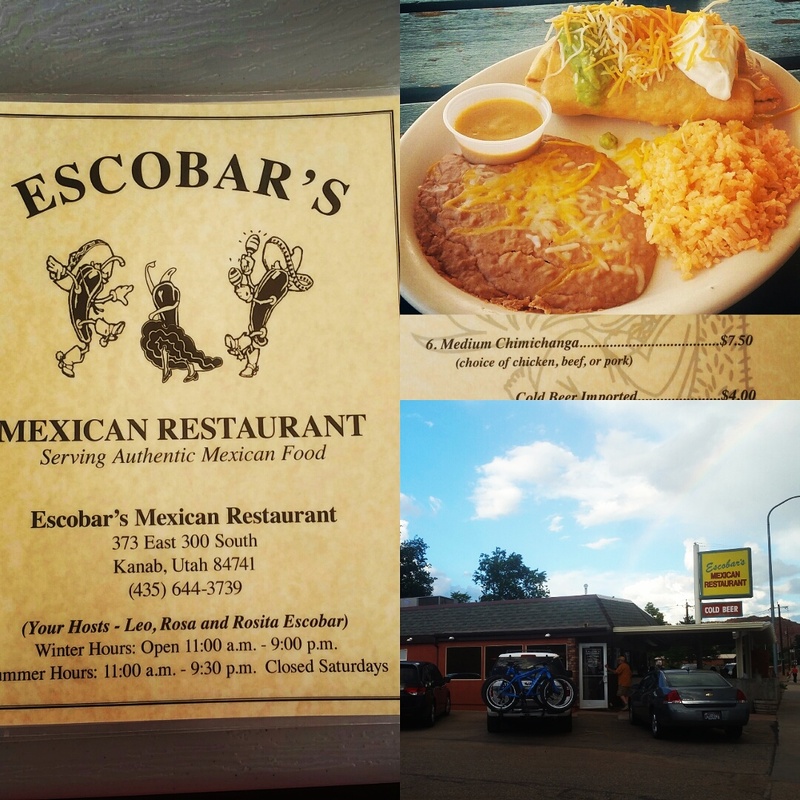 you set the bar for Mexican food in Kanab!